Food In Your Vehicle - What's Best For 72 Hour Survival Kit? Do you keep any ‘survival’ food in your vehicle? Is it more than just a few snacks for while on the road? I’ve posted a number of articles on 72-hour kits to be kept in one’s vehicle along with suggestions for items that you might include. One important item is food. While the vast majority of circumstances will benefit from simply having a snack, you don’t want to overlook having some substantial food too. There are some hypothetical scenarios whereby you might not have the luxury of stopping at a fast food joint, grocery store, or other establishment to get some food. And it’s good to consider this for preparedness while on the road. I do keep a variety of foods in my truck as part of my 72-hour kit. I also rotate this food during the year to avoid spoilage. It’s especially important to rotate given the summer heat that can build up inside the vehicle which greatly reduces it’s shelf life. With that in mind, let’s think about what specific foods or types of emergency food might be better suited for keeping in your vehicle. This is what you will likely semi-regularly dip into. A quick little snack. For this purpose I keep a handful of ordinary food bars of various flavors, brands, and variety. I keep them in a Gallon size Ziploc bag which I store in the center console. They’re out of direct sun that way. Although they still get good and warm during the summer, I do rotate them indoors after awhile. Note: The soft gooey type food bars will melt in the heat. To avoid this you might focus on the granola type (harder) bars. Note: Food bars will run anywhere from 100 calories to several hundred each. While you will be much less likely to actually consume these (reserved for actual emergency or SHTF or bugout), you should consider counting enough calories for 3 days (general rule of thumb). That’s potentially a lot. You’re looking at 2,000 calories per day. So how are we going to come up with enough food that will actually fit somewhere in the vehicle without getting in the way? 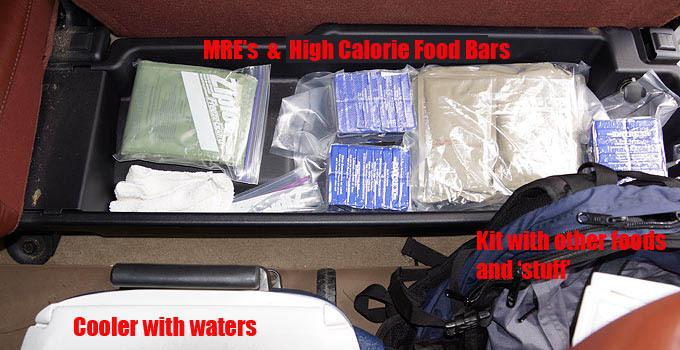 I keep an assortment of MRE’s, specific high calorie food bars, some cans of chicken, even some peanut butter which is very high in calories (energy food!). Can opener, fork & spoon too. Pay attention to the calories so you have enough. Also go with some variety and balance. Maybe some sweets too (a quick boost). This can be tricky. A smaller vehicle has less room than a big truck (for example). Be creative. Nooks and cavities here and there? Use them! I keep a backpack in the truck with some of my other emergency kit supplies (and some more food). I simply keep it on the floor in the back seat. You could use the trunk. Tip: My water (except during the winter) is kept in a cooler on the floor in the back. Surprisingly the water bottles don’t get hot in there. Okay, so any other ideas for ‘survival food’ that might be better than others to keep in the car, truck, or vehicle? In the summer I keep some Gator aid and gum in my truck for salt replacement and to reduce the amount of water I drink due to a dry mouth. Matzo bread. If it was good enough for the Israelites fleeing captivity in Egypt, then that is good enough for me. Couple of MRE’s, and a few Dex Bars. The Gat-Yar-Azz-Home-Bag is always in the truck too. I figure 3 days and I better make it on chewing on a few sticks and rocks. Water on the other hand…. That’s a different Article. Great for rehydrating and making questionable tasting water tolerable. I have 2 to go bags in which ever car/truck i drive all the time. Nearest big town in 160 miles one way and the nearest small town is 70 miles one way. I am prepared to cook, camp and sleep if I had to walk home. Curious about the foods that you choose to keep with your ‘go bags’… especially given your distance from town. – A 16-oz jar of peanut butter, cheese & crackers packages, about 4 cans of sardines, packs of MRE crackers, a couple of MRE entrees, and several of the packets of crystal light to add to water bottles. At least half a case of 20-oz water bottles in an igloo cooler, that gets changed out pretty regularly. I know there are some Clif bars in there, but not sure exactly how many. More than that gets kind of heavy. – For me it’s at least 45 miles, to a possible 100 miles. If I go the long way, I have a small creek roughly 2/3 of the way. – I also have 3 of the Datrex bars under the back seat. I never touch them under anything like normal circumstances, so don’t think about them. They do go bad. Tasted one several years past expiration and will admit it had been stored in a high heat area for years. Tasted pretty bad. Believe they hav a coconut oil in them that goes rancid. Don’t forget about attracting rodents. They are a real nuisance around here and even find their way inside brand new vehicles. A metal mil spec ammo can is more resistant than plastic and is easy to grab and go with. two weeks worth of mre’s and instant meals…. as well as shortbread high calorie bars (2400 calories each) fruit high calorie bars (1800) in several flavors and multiple lifestraws along with 10 gallons of water. That is OUTSIDE the regular BOB’s that have a 3 or 4 day supply in each one along with MORE lifestraws and bota bags. Since some of my appointments take me 3 hours from home (round trip is 6 hours) I figure it best to be very prepared. BOBs have warmth and sleeping gear as well. I’m stocked adequately these days. But when I was a very young man hitchhiking from the west coast with $1.75 in my pocket I bought a jar of peanut butter and a loaf of bread. That got me and the girlfriend to Minneapolis. I need to write a book. It would be filled with a lot of advice on what not to do. You and me together could write a series. When I was a teen we would buy a jar of PB plus a loaf of bread and grab a jar of blackberry jelly my grandmother canned. We would take off for the river with shotguns and fishing poles. We all had an enamel cup and our cooking pots were already in the woods. We would hunt and fish all weekend. We never went hungry and usually had a squirrel or rabbit over the fire. It’s amazing all the things we “need” now. I keep a cooler with a couple MREs, bottled water, and granola bars. I have told my wife that if things get crazy, get away the best you can. When things have calmed down, stop and eat something. It has a good calming effect. BTW, if you know anyone who has access to the Commissary, they sell fresh MREs . The price has jumped from $9 each to $10 each. But for a complete meal with a lot of calories, it’s still tough to beat. To each his own I guess. I don’t see food as anything but for comfort and energy when planning and stocking a 72 hour kit. Dietary needs aren’t paramount for three days. Doesn’t mean it should be completely ignored. I keep a couple of containers of the cheap, dry, and hard store brand iced oatmeal cookies. They’re the sweet equivalent of hardtack, and in my experience, never go stale. Those “cookies” plus a jar of peanut butter will provide the energy and hunger fighting needs very easily for that short period. A couple of cans of vienna sausages make it a gourmet meal if you’re getting hungry. Haven’t seen anyone else mention it, but keeping the kit in a dry igloo type cooler goes a long way in moderating the temperature extremes it’s exposed to inside a closed vehicle. Cliff bars, glucose tablets,, and water. durn burn it, that was Dennis. I swear I checked the save box last time I posted. – Dennis, when i was a teenager just starting to run around more than five minutes from home, I used to keep the same thing one of the local TV weathermen told the world he kept in his car and airplane for emergencies. That was a jar of peanut butter and a bag of ginger snaps. Same thing, keep forever, or at least as long as the peanut butter would. That, matches, a candle, and a wool blanket for winter travel. Forgot to mention that I vacuum seal the Datrex packs, even though they are already sealed. Double protection. I do the same thing but I suggest, from prior experience, to duct tape the corners of the bar prior to vacuum sealing, the foil packaging is very sharp and after numerous rough handling’s, can easily poke through any plastic packaging, even the heavy vacuum bags. I also recommend an additional ‘freezer weight’ zip-lock bag, either folded and placed inside prior to vac sealing or just placing the vac’d pouch into the zip-lock because, once you open a Datrex food block, the bar itself is very ‘crumbly’. (FYI: after 24 years in the Army, all of them in the Airborne Infantry, Freezer weight zip-locks are the only weight I use in my packaging, all others, even the mid-weight ‘storage bags’ are too lightweight, and sometimes, even the freezer weight doesn’t seem heavy enough.) GOOD ARTICLE! Excellent advice. Thanks. I will be wrapping my vacuum sealed Datrex packs in Ziploc today! Luckily, they’re still holding a seal. But good idea about the sharp corners being taped prior to vacuum seal. I have also noticed over the years how Ziploc bags in general have seemingly got thinner and less reliable. Even today’s heavy duty bags don’t always hold a seal. More Wall Street profits I suppose at the expense of the consumer. – Amen! on the freezer weight bags. Will tape and bag those blocks tonight, after checking them out thoroughly, of course. As a retired Marine I concur. Freezer bags are cheap and hard to beat! 2 large cans of bakes beans, 2 cans spam. 1 12 pack bottled water. All simple food things I can replace easily and quickly. And any hot days I always have soda, gatorade and sometimes orange juice with in a cooler. – Some years ago I tried a Russian “MRE”; didn’t care for it, although it was ‘interesting’. I think I’ll pass on the Russian survival food, thank you. Katydyn (sp?) Water filtering bottle, gum. Used to have some fruit/granola breakfast bars and power bars but times are tough and they got eaten. Hope to replenish with some good survival bars. If you are in bear country, don’t keep anything that has an odor in your car. I don’t know how many times I have heard or read about a bear getting into a car to get some goldfish crackers or a banana or something, then getting trapped and literally tearing the inside of the car apart. This obviously not food but I also keep a roll of quarters and $40 in ones just in case I come upon an operable vending machine. That’s a great idea. We also keep a bag of quarters in the truck. Good for a number of different possibilities. Pound of beef jerky, pound of raisins. pound of smoked almonds, 2 tins of smoked baby clams packed in oil (better than sardines). I almost look forward to rotating them out. Nooks and crannies have granola, fruit and nut, or protein bars. In winter, a small flask of Crown Royal nerve medicine. 1 gallon and 1/2 gallon canteen and a smattering of bottled water. Here in the desert you need plenty of water. medium size ice chest with a frozen water bottle of about 7 lbs. (Gallon water bottle that gets rotated out from the standing freezer every day before I leave.). The ice chest contains 1 coke, 1 sprite, 1 gatorade or vitamin water, string cheese, several pepperoni sticks, chocolate or cookies with chocolate, and 3 pint bottles of water. There is still room for other products from the grocery store as I shop before I go to work rather than after I get off work. Outside the ice chest, I carry pretzels or saltine crackers, a small metal pot with trioxide tabs and 2 ramen noodles and 2 cans of soup. 1 pint bottle of “nerve medicine in the form of Irish Whiskey”. a double bagged ziplock containing home made trail mix with a lot of nuts, raises, M&M’s and dried mango. It is hay fever season these days so I carry Benadryl tabs, Claritin tabs, Alaway antihistamine drops for my eyes and artificial tears. Lastly, I also pack clean dry socks and underwear in a small separate bag. My truck is well maintained so I have not had to tap into the ramen noodles or canned food on a long walk home. The pretzels or saltines get used at work a lot for patients with intractable nausea and vomiting. ( pregnant ladies out there will understand.). Lastly, my truck has a “triple A” card and a stash of cash in small bills. Can you tell I drove ambulance for a lot of years? My home made trail mix contains: peanuts, almonds, raisons dried mango, almonds, M&M’s. It is pretty rich so I balance it out with the saltines or sandwich bags of granola. Food most often tapped into at work: Sprite and saltines for the nauseous people. String cheese and pepperoni sticks for the new inexperienced nurse that is invariably female and on-a-diet. ( aren’t we all these days.). It takes a few years of experience to realize your body needs more than celery sticks to make it through a 16 hr shift. I have a small metal tool box that I keep those survival bars in. Each bar is 3-days worth of food. I also have 2 jars (plastic) of Survival Tabs. 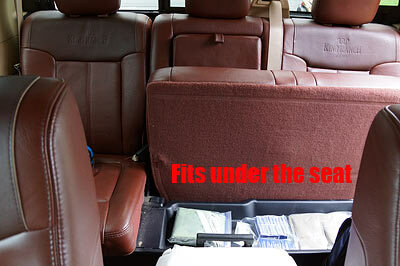 I have a compartment in my van where the fold down seats went. I use the van for work and ripped out the seats so this gives me a lot of space. The metal box has 2-months of bars in it and the tabs are 10-days of food each jar. I don’t actually expect them to last as long as the package says it will, but I figuee it’s at least 1.5 months of food. Plus I have 2 water filters and other survival things in there. Plus it’s a work truck, it always has junk food I eat driving between jobs. Everyone should test the flavor and make sure you like the survival food you are storing up. The Survival Tabs are very good, you could eat them as candy. The Survival Bars are dry but good enough to eat. They taste like a dry cookie. Chuck…sorry.spelled your last name wrong….Chuck Findlay, meant to write. The water thing is more that I like and drink a lot of water. I don’t carry a lot of water as it rains a lot here (Toledo Ohio) and there are ponds, streams all over the place. And there is the biggest fresh water system on the planet (The Great Lakes) a few miles away. The water table is very close to the surface, it’s like 9-feet down and less in some places. I have water filters to filter it for cooking (I have a camp stove and a cook set in my van) and drinking if needed. The Survival Tabs are borderline delicious, they are small tube-shaped things about the size of a dime and 3/4 of an inch long. And it would be very easy to eat a lot more of them then needed. They don’t make my thirsty at all. The emergency bars are a block of hard cookie like things about 9-inches square and 1.5 inches thick. They taste OK and are like a dry cookie so that’s why I said water would be helpful. I drink a lot of water anywise so I always have a few bottles of it with me. I don’t think the Mayday bars make me any more thirsty then eating other food, but I drink water with any meal I have. The bars are “Mayday” brand. They also say “Emergency Food Rations” and come in 1,200, 2,400 and 3,600 calorie size. I mostly have the 3,600 ones. It says on the package they are US Coast Guard Approved. They are easily broken into pieces (9 of them) for a meal size. the 9 pieced would make 9-meals for a 3-day food source. The 3,600 size ones have an apple cinnamon cookie flavor that I like. The 1,200 ones I can’t remember what flavor they have and the 2,400 ones have a coconut cookie flavor. The 2,400 ones are my least favorite ones but still are OK. I have not tried to survive on them but I did break up a bar and put it in a Zip-Lock bag and munched on them while driving between jobs. I also eat them when they come up on expiration, it’s not hard to do if you like cookies. I buy a few of them every year and rotate out the old ones. A few months ago I did this to a package dated 2015 and they tasted just fine. I says on the package that they don’t make you thirsty, but they did for e. But then like I said I already drink a lot of water (I drink maybe 8 or 9 bottles (32 oz Nalgene bottles) of water every day so I always have some ice water with me when I eat and throughout the day. . The Mayday bars cost $5.99 at a local store (so local I could hit it with a pellet out of my pellet pistol. I buy 1/5 doz of them every year to rotate stock. They are inexpensive, right down the road and why not keep them fresh? The Survival Tabs I got off Amazon for $25.00 each or $20.00 if you order more then 4 of them. I ordered something like 15 of them after I got the first one and tried it. One thing I forgot to mention about the Survival Tabs, they are purposely put in a plastic jug that is made to fit inside a US Military canteen pouch so they are easy to carry and have on hand. And also once used up the jar can be used as a canteen. Actually a well thought out idea. I have a LOT (OK a bit more then A LOT) of the Mountain House meals but I don’t have them in my van as they need cook and simmer time and I don’t see this as something I want to deal with when I would likely be on the go and working my way home. Mountain House meals are some of the best tasting food there is, but they take time to cook. I have them for home food reserves, not in my get-home bag. 5 mountain house freeze dried meals. I think I’m going to add additional 2 cans beef stew when I rotate and feed the old canned stuff to my dogs and change the mountain house single serving pouches to the 2.5 serving pouches. that take up a lot of space plus my one and a half backpacks, the ghb/whatever bag. extra pack will carry the car food and it’s the one i’ll dump when it becomes unnecessary. The datrix ans russian survival food, won’t ever be eaten unless it becomes necessary. but in situation when your hungry taste is not priority. I’ve tried several items and the menu which has stood the test of time is Peanut M&Ms, GORP and Ramen packets. The M&Ms and GORP can be eaten on the go, and the Ramen is good for hot and cold weather. The salt is appreciated in the heat, but ONLY when you have drinking water.